That new 'Berserk' is a TV series; 'Fullmetal' out-of-print-be-missed, and 'Moribito''s live action version is looking mighty good. Going Berserk: Some more details about that new Berserk project. It is indeed a TV series, and it debuts in July. It's a shame that the source material has dropped back to such an intermittent production schedule, though; I'm wondering if Miura is (pace George R.R. Martin) just getting sick of the whole thing. 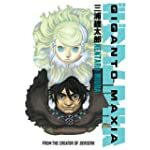 I still have his new production Giganto Maxia waiting for me to read, so I'll be reporting back on that sometime this month. Maybe we should call it Fullmetal Soldoutchemist: Funimation is apparently losing the rights to a title that seemed like it would have been an evergreen for them: Fullmetal Alchemist: Brotherhood. What makes this particularly bad news is the way Aniplex has been making it all the harder (and more expensive) to obtain many of their titles, and how this has been one of the titles that gave Funimation its top place in the U.S. market, the other being the DragonBall franchise in all its myriad incarnations. We've seen plenty of examples of how the U.S. arms of Japanese anime outfits tend to do a poor job, so this does not bode well on any front. Sum of comment: If you've been considering picking up Brotherhood, now's the time. Ghost in a new shell: Production of the live-action Ghost in the Shell movie has been shuttled over to Paramount, where it will continue to turn into something that has little to do with the property that shares its name. Call me faithless if you like, but let's face it — the track record for J-to-W live-action adaptations is rather pitiful. Shame on you: This is some guy on YouTube. He posted a hoax trailer for the next Evangelion. He's kind of a jerk. Don't be that guy. Meanwhile, in the world of real trailers that look wonderful... : I speak of the trailer for the new production from LAIKA, Kubo and the Two Strings. This looks promising enough that I might end up reviewing it in these here pages.